When it comes to selecting your new counter tops the selection can be daunting to say the least. Granite, Marble, Concrete, Tile, Quartz, and many other man-made options are what most select. Why am I writing about Marble Counter-tops you ask? Because of the high number of phone calls that I get from someone who had them installed months, weeks, or even days ago. And they are having problems already. Note: Not all marbles are acid sensitive, most are however. The calls I get are obviously from the latter. Sadly it seems that most installers are not giving the right care instructions or none at all. Taking care of granite counters are 100 percent different than marble counters. Assuming that our clients know the difference is a severe lack of communication. Ok, now that I got that off my chest, lets move on. Your new Marble Counter-tops need special care or awareness from the very beginning in their new home. No longer can you clean them with just anything. Now you have to watch what you clean the mirrors over the counters with as well! Most glass cleaners will dull the marble over time, some instantly. Can you picture the spray that drops onto the counters as you mist the glass? That is going to harm the marble. Drink glasses that get set on top of the counters typically have acidic beverages in them – yes these are going to etch the counters as well. Now your typical cleaners sold in stores come to rest on the surface, some harm it and some do not. If they are tile and grout cleaners than most likely they are going to harm the surface. We cannot cover everything that will harm your marble counters in just one article, but let me just say that anything acidic in nature will. Make-up products and After Shaves are the biggest culprits. Consider purchasing a 12″x12″ (or the best size for your counters) beveled piece of glass with felt feet and using that to set your drink glasses on. 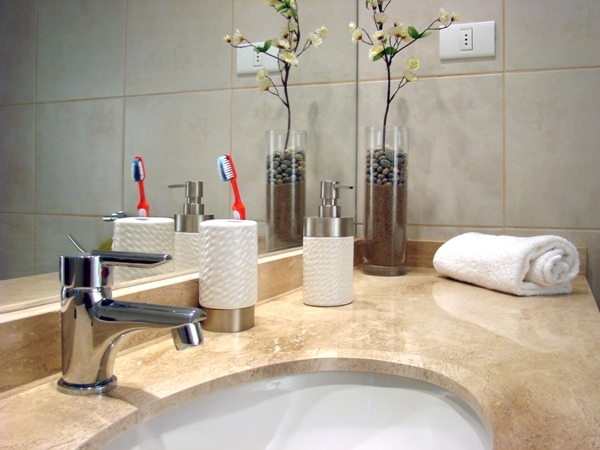 These few ideas should go a long way toward keeping your new marble counters in great shape. Good Luck!